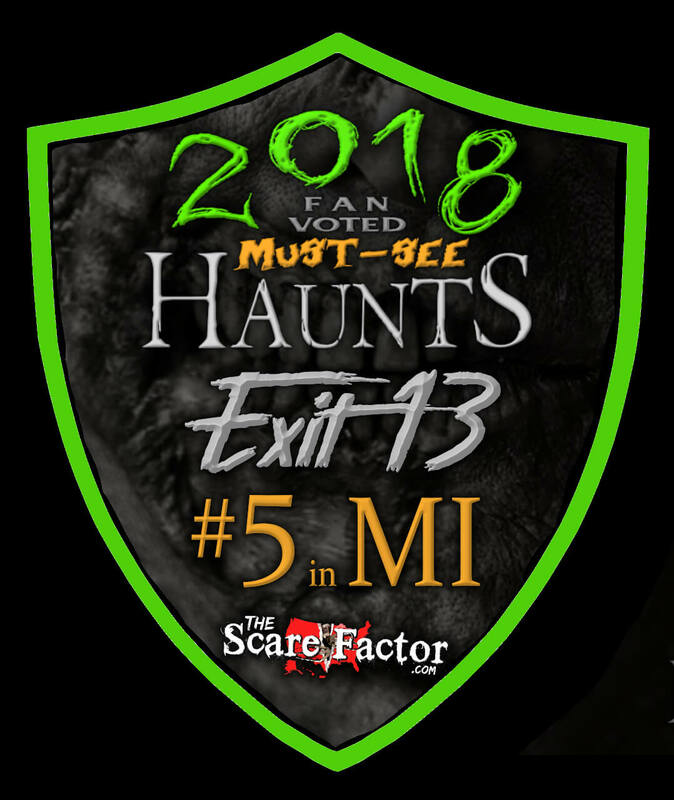 Team Michigan Macabre reviewed this Haunted Attraction on September 22, 2018. 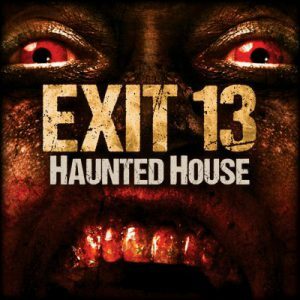 Exit 13 has a well-known reputation in Michigan as being an intense, hands-on, extreme thrill ride. After experiencing Exit 13, we can safely say that is accurate! The actors are in your face, the blood is extra bloody, and the scares are nerve-racking. The amount of time, passion, and energy put into this haunt are evident once inside. The owners begin working on the haunt as soon as the thaw hits every year (because the vast 13,000 sq. ft. venue is not heated over winter), and they continue until opening day. All of the detail within the scenes, the secret doors and hidden rooms, and the devotion of the actors create a truly haunting experience. The actors can, and will, touch you here unless you opt out of that portion by purchasing some “monster repellant” ahead of time. You may be separated from your group, you may get picked up and taken away by a clown, and you may, have an amazingly scary time. So what are you waiting for?! The cast was appropriately used and placed throughout the haunt. The actors made you feel wholly encompassed in the scenes they were directing. Not one actor comes to mind that performed anything but compellingly and engagingly. The engagement of the actors with our group was evenly distributed. The actors had singled out every member of our team at one point or another. They forced us to be utterly alone in the haunt without the comfort of our other team members, which was extremely memorable. Of course, you could always rely on the comfort of the three clowns chasing you down the hallway. All actors were original and all authentic to Exit 13. There was a good mix of those who screamed in your face, forcing you to engage, and those that silently stared, blocking your way, and then horrifyingly caressing your face for good measure. Can I get some tips on that death stare for my husband? The actors utilized each other, their scenes, and props to make a genuinely connected experience. Most memorable would have to be the doctor seeking a liver, while thrusting his gurney full of dead carcass and blood. Somehow, the carcass’ blood ended up on our team member’s face; things got crazy! There were too many amazing actors to mention them all here, but we must give props to a couple; the doll with her unexpected appearance and actions, and the pig man complete with snorts and wiggles of his snout were quite entertaining. Costumes were intricate and looked handmade in some instances. You will not find these at your local store. Wigs, movie quality masks, eye contacts and details going down to shoes and gloves made these actors complete. The most memorable mask was in an empty hallway with a large man silhouetted at the end with his own soundtrack playing. His mask was one from nightmares; we will not detail it here, but we will let you seek him out for yourselves! Even the costumes had a second level of weirdness, including their own individual smells; this gave their presence that much more substance. Each actor had the ideal costume while in their respective scenes and this added to the suspension of disbelief. Exit 13 has to be one of the easiest haunts to locate as it is just off, yes, Exit 13 of Freeway 475. The building is huge and, with the outside corn stalks and large skull, you cannot miss it. Actually, the first thing we noticed was the concession stand with everybody’s favorite, funnel cakes! Yum. Drinks and other snacks were also available. At the end of the haunt is a gift shop with photo opportunities. Parking was a breeze. Small signs direct you inside, and we initially walked the wrong way until we saw a Do Not Enter sign next to the concession stand and we turned around. A little confusing, but no harm though because the staff was just inside to welcome us. The haunt is wheelchair accessible per their website. Staff was professional, efficient, and interested in providing us with a good time. Rebecca, one of the owners, was a gracious hostess and after speaking with her, you could tell she oozes passion for her haunt. The fake house facade with cornstalks and a giant skull greet you when you arrive. The night we went was when a local radio station was present broadcasting, so the radio music was in full swing. The queue line is indoors, and aside from the radio music, spooky soundtracks were playing which probably is what is heard on a typical night. Our group went into the VIP entrance and did not experience the main entrance and queue line, but the VIP hallway was lit with red mood lights and eerie music. It set a solemn mood but not so much for an entrance to a haunted house. There was nothing to build our anticipation or prep us for what was to come. Once we were let in, we were briefed with the rules and left to fend for ourselves. Upon exiting you enter the gift shop area which is decorated nicely with props and a giant demon monster for an opportunity for a photo. This is where the “Buried Alive” portion is if you would like to simulate being in a coffin. Sounds within the haunt varied and were never overbearing or too quiet. As I mentioned before, one actor had his own soundtrack which was very impressive to hear. The scenes are unique and creative from floor to ceiling in some cases and very detailed. The forest area with snakes and foliage was impressive, not to mention the forest monster you come across! The funeral home and hotel room were involved, and an actor slowly shows you around to parts you would not have been able to maneuver without his help. Of course, there is a spinning tunnel or two and a disorienting laser, but the detailed scenes completely drown you in their originality. You will get placed into their dark world, with no foreseeable way out. 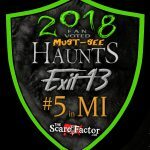 There is not one overarching theme in Exit 13; but rather, the haunt pays homage to all the significant fears one may have to hope to strike a horror chord in everyone who is brave enough to go through. How scary was Exit 13 you ask? Extremely. They have a range of frights from startling scares, to quiet areas building anticipation, to in-your-face actors touching, grabbing, and pulling you right out of your comfort zone. Impressive were the unpredictability of the scares and the collaborative work more than one actor did to successfully distract and frighten you. When they accomplished this, it easily provides multiple opportunities to surprise scare you without being able to prepare. Losing count of the clowns at the end proved to be a mistake on our part as they successfully played out their game with us as victims. It took our team about 25 minutes to run screaming from Exit 13, and it was worth every penny! With general admission being $20; that is a minutes-per-dollar score of 1.25, which is close to average for most haunts in the region. However, we were told the time through varies for each group; some people run and try to escape as quickly as possible, and then there are people like us who want to take in all of the great scenes, details, and actors’ abilities. It felt as though they utilize all areas of the haunt well and very intricately in some instances, needing to crawl or shimmy your way through.